Almost all security suites have anti-spyware, a firewall and other features, but some minor features take the cake. It’s these that we shall focus on. We’ll compare the features of some of the most popular antivirus packages, namely, Avast, AVG, Norton, Kaspersky, and TrendMicro. A boot time scan lets you scan your full HDD even before Windows starts. The main advantage of this over a normal scan is that most dormant viruses and malware that aren’t detected easily during a normal scan are easily found out and removed. Another advantage is that boot-time scan bypasses the Windows fi le system drivers and uses direct disk access that results in lower scan time and detection of background root-kits. In Avast, open the main Avast user Interface, right-click and select Schedule boot-time scan from the context menu that appears. Next time you restart your computer, Avast will perform a full system boot time scan. With AVG, you can change the settings in the Options menu. The scanner option has the ability to modify the settings. Kaspersky does not have a boot time feature. 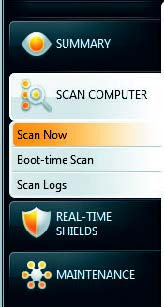 Many security suites allow you to run a full system scan whenever the computer is idle. For a lot of systems, a full system scan can slow down your system. In Avast, for example, you can schedule a full system scan whenever your computer is idle by using the anti-virus screensaver feature. It can even be run over your normal screen saver. Whenever your computer is idle for the time that the screensaver is set to come in, Avast will start scanning for viruses and pause immediately once you come back to your computer. To enable this, go to your screensaver properties window and select Avast! Antivirus from the list. In other software suites, it may not be called Screensaver mode. Instead, like Norton, it is referred to as Idle Time Scanning. Norton can perform scheduled scans when your PC is idle if the “Only run at Idle Time” option is selected. Select the Settings > Task Scheduling Idle Time option. Other systems optimize their scanning to ensure that normal functioning is not disturbed while scanning. Features such as Fast Scan and optimized background scan are prevalent. Most security suites have realized the importance of disabling notifications so as to improve the user experience. Except TrendMicro, all the security suites we reviewed for features had an option, either as Silent Mode or Gaming mode or a similar name. Avast has it, in its main user interface. In Kaspersky, right-click on the Kaspersky icon on the taskbar and click on Settings > Gaming Profile. Click on enable Gaming Profile. You have the option to disable scans, disable updates, or instead of notification, just take action automatically. Kaspersky chooses the best course of action based on the threat rating and previous choices. 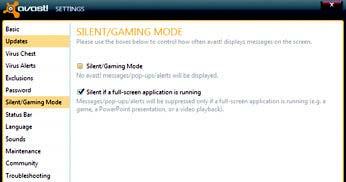 Norton has both options – Full Screen Detection (Gaming mode) and a Silent Mode. It activates automatically when you watch full screen applications. Similarly, Silent Mode is a manual operation to do the same. You can do so by going to Settings > Administrative Settings. In the Silent Mode Settings, set the Silent Mode to On. In the Turn on Silent Mode Box that appears, select the duration from a drop-down list. AVG Firewall includes a “Game Mode”. This can be set under Settings. Alternatively, click on Firewall from the Main Control Center and enable Game Mode. If you use webmail services such as Yahoo!, Gmail or Hotmail, chances are email is secure. 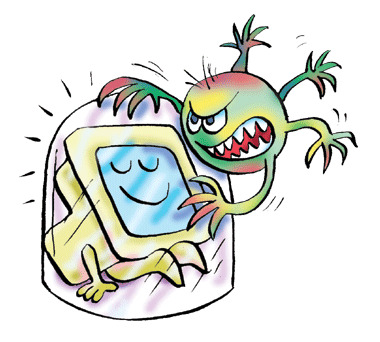 However, if you’re using a client such as Microsoft Outlook or Thunderbird, you have to independently scan your mail for viruses. This feature all security suites have. The new Avast v5, goes one up by having a fully integrated anti-spam feature. In all security suites, you have the option of customizing the sensitivity level of your detector. 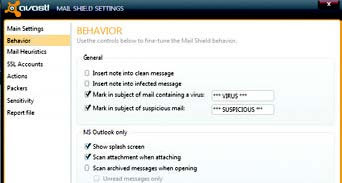 Go to Real Time Shields or Email Protector, or Mail Scanner or whatever it is called in your antivirus program, go to settings. Chances are, to specify the level of customization; you may have to go to Expert Settings or Advanced Settings. The same sort of sensitivity specification is not restricted to the Email scanner. All Firewalls also have the same feature (some even have a program specific option). Though the manual scan option is available to scan specific folder fi les, some security suites can automatically detect when an external drive is plugged in. Some can even erase malware without notifications. If your anti-virus doesn’t have this function, it’s a good practice to scan your removable media for malware. In AVG, you can go to Tools > Advanced Settings Scans > Removable Device Scan. Tick the checkbox to Automatically Heal / Remove Infections. Kaspersky and Trend Micro have the same feature enabled. Frequent downloads from unknown sources using a torrent tracker or a P2P fi le sharing program often pose a high risk. The security suite monitors all the recognized P2P programs installed for downloads and checks the fi les as they are downloaded (real-time). Avast has a P2P shield under its list of real-time shields. You can go to Expert Settings and change the list of programs that should be monitored. Kaspersky also has a P2P/File Sharing monitor.